Winter Farm Fun – Day 1 | NJNA is Blogging! The weather was much better today than yesterday. A beautiful blue sky and bright sunshine … Even though we were indoors, the beautiful autumn weather was still uplifting. Upon arriving at the class this morning I was delighted to see that the canvas Winter Farm Fun is even more gorgeous than the picture I had seen. This is the type of canvas that has intimidated me for many years – beautifully painted with stunning shading. Although i have one or two in my stash, I have hesitated to try to stitch them as I thought the stitching would actually detract from the piece. I could never imagine how to recreate all that shading. Well, now I know. 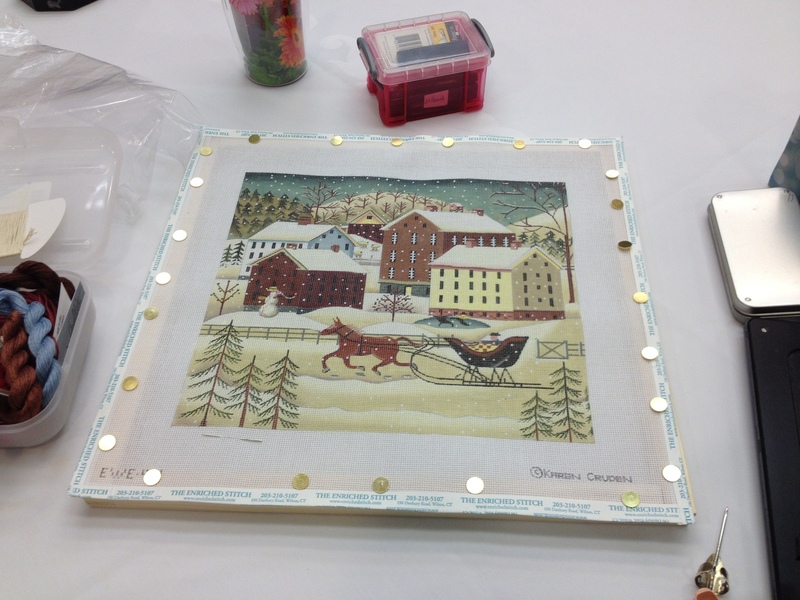 The coverage is very light on this canvas with lots of open stitches so that the painted canvas shows through! Suzie Vallerie, the owner of The Enriched Stitch, is teaching the class along with two assistants. The class is very relaxed and no one from the needlework police is in attendance. 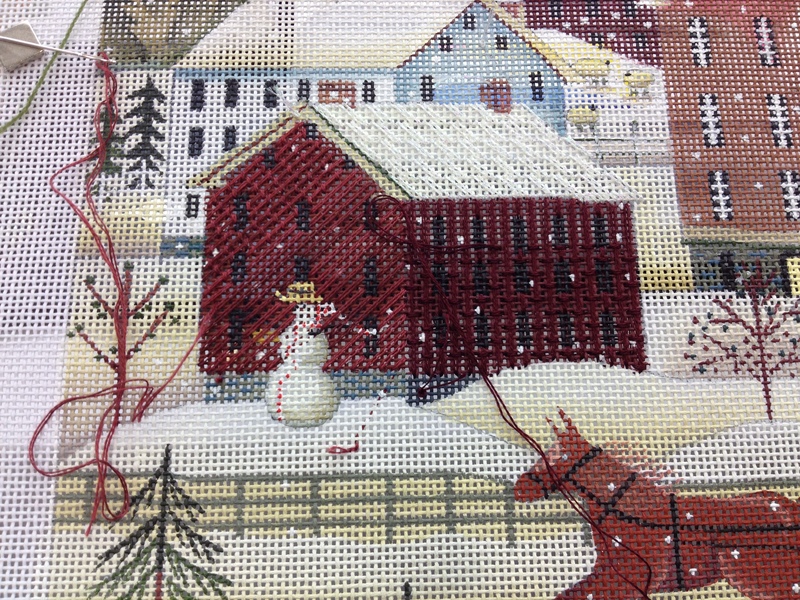 Today we worked on the sky, which is stitched with Accentuate (not an easy thread to manipulate) as well as the snow (done in a darning pattern), some of the trees, and the red house on the left side. Here you can see my progress on the house – the exterior walls are done in Weeks Dye Works and the roof in Kreinik. Tonight I am going to try to finish some of the threads that have been started, just so I can start off tomorrow without a lot of spaghetti. 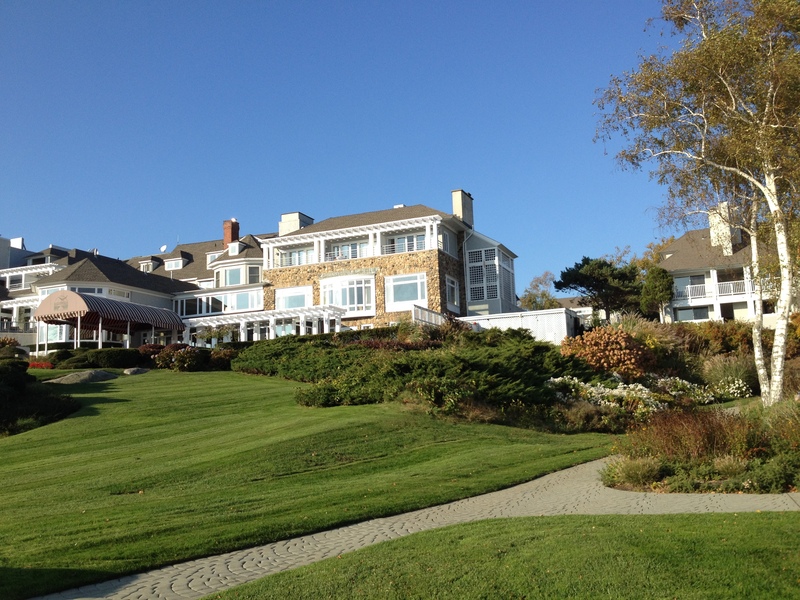 The hotel facilities are terrific and the grounds are stunning. 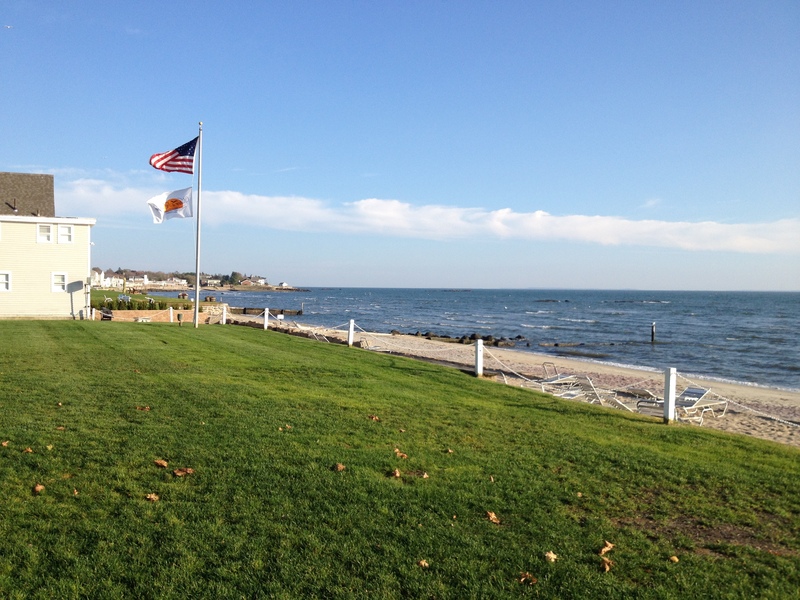 After we finished stitching for the day I took a walk around and even visited the beach. Then I had a massage which I really needed after a day of stitching. 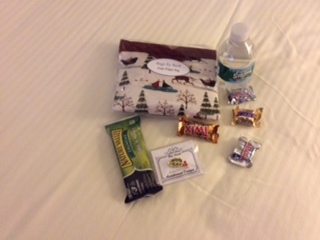 And I was remiss in not posting that we each received a lovely “goody bag” upon check-in at the hotel. 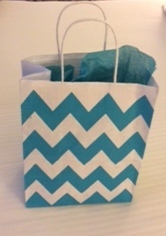 All the necessities – a bottle of water, a needle magnet, a very cute little accessories bag, and chocolate! Day 2 tomorrow after which I will be heading home. Please keep your fingers crossed that I-95 through Connecticut is moving smoothly! 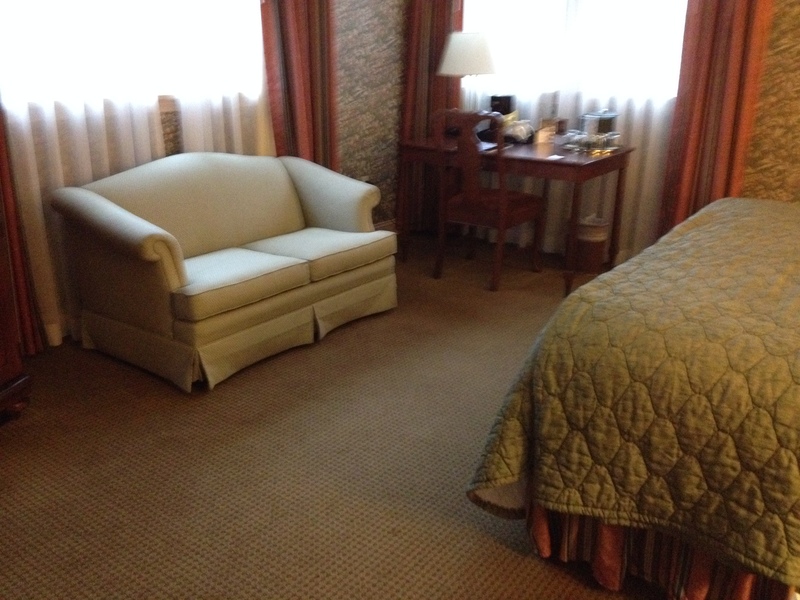 I am not sure if I am more impressed with the location–room and view–or the piece you are stitching! I never thought about not covering every intersection completely so that the painted portion comes through. Looking forward to seeing iir in person. It’s definitely a first for me leaving so much canvas exposed. I’m going to have to keep an eye out for their future retreats. What a gorgeous piece as well as a fabulous setting! Next year’s retreat is a Melissa Shirley design. It’s supposed to be a Nantucket basket. I can’t wait to see your project — my canvas hasn’t arrived yet.